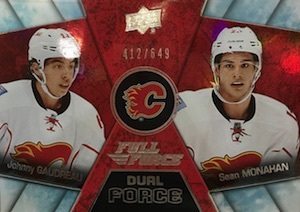 2015-16 Upper Deck Full Force Hockey is a new addition to the UD Hockey brand. With a heavy focus on technology, each box includes multiple inserts. Kicking things off, the 100-card base set is joined by a Die-Cut Rainbow parallel that is numbered to 25. 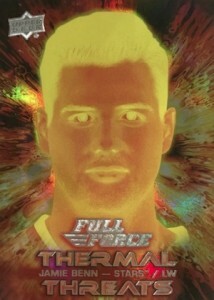 There are also Full Force Freshmen rookie cards that utilize a 3D lenticular design and fall one per box. 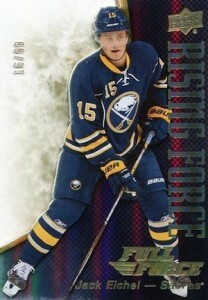 Providing more rarity, a Die-Cut parallel for the Full Force Freshman cards averages 1:120 packs. Rising Force inserts add to the focus on technology with dual-layered PETG acetate cards. In addition to the base version, there is a Dual Force option. Both clear plastic cards combine to average two per box and all are numbered. Gold parallels are limited to 50 copies or less. Making heavy use of rainbow foil designs, Calder Competitors, Draft Board, Ice Encounters and Thermal Threats inserts combine to drop at least four per box. 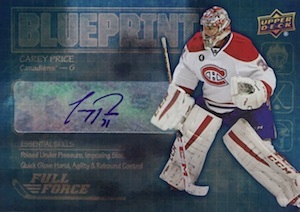 Blueprint inserts are a little more common at six per box and there are also signed versions. 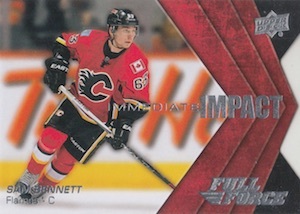 Among several die-cut inserts, Goooal!, Immediate Impact and Valuable Assets total at least four per box and can be found as rare autographed parallels. 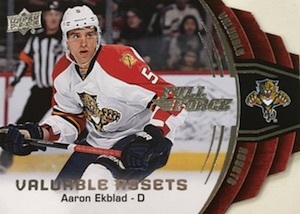 Although traditional hits are not as prevalent in 2015-16 Upper Deck Full Force Hockey, autographs fall in every other box. 123 cards. Shop for the base set (#1-100) on eBay. 47 cards. Individual group odds noted below. 12 cards. Serial numbered #/649. Hobby only. 20 cards. Individual group odds noted below. 14 cards. Individual group odds noted below. 30 cards. Serial numbered #/999. Hobby only. 9 cards. Individual group odds noted below. Is this a real product? Thermal Threats? Ice Encounters?? What is happening at Upper Deck? Is this their way of bringing lower end products back? you guys are nuts !! this looks like a really nice product !!! upper deck is just trying to be creative !! ud1 and ud2 and spa are great products but….SOMETHING NEW IS ALWAYS GOOD !! how do Ronalds Kenins, Josh Jooris and Andraj Nestrasil have an insert card in the goals set along with guys like crosby and gretzky and they are not even full timers in the NHL better yet stars ? Why couldnt you put guys like the Sedins, Benn, Seguin, or other bonified goal scorers? I think this is just another money grab product from Upper Deck and I would not be buying any of this even if I had the money? I purchased two boxes today and had some nice stuff. I also completed the base set. 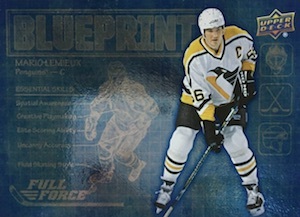 The Blueprint cards are nice. I had something for each top rookie except Connor McDavid. 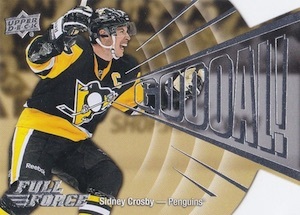 Best card was a parallel base die-cut rainbow card of Crosby /25. The one thing that sucked was no autograph in two boxes. This would go against the average as per Upper Deck. Great box for kids at Christmas if they want some cool rookie cards to look at. 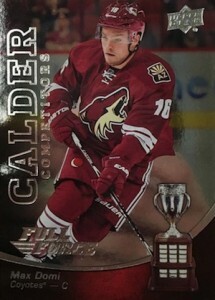 The design of some of the cards is very childish, there are some players that shouldn’t be there, such the ones mentioned by Canucks88, and there are no Jerseys or Patches. For a mid-end product I find there are a lot of flaws. I like the idea of a new product though and the acetates design. A fair number of autos and serial numbered cards. This product turned out to be very unappealing. Cards look silly, insert names are silly and a weak checklist…Oh yea, there ARE redemptions after all. Upper Deck said this product had ZERO redemptions. What say you UD?? how do you have redemptions for signatures when there are so few? after you lied about that?? LOVE the originality of this line! It’s so nice to see cards that really stand out from all the other sets. Can’t wait to get another box. Overall, my experience was great. There were lots of McDavid and Jack Eichel cards. I think the cards look sharp, the acetate cards, foil rookies, lots of serial numbered cards, great autos with a couple of weird exceptions (Thermal Threats for example…is a little creepy, but kind of cool at the same time). I say kudos to making a brand new product. UD is never going to please everyone no matter what they do, but I know I was sick to DEATH of the Series 1 boredom after the first 50 cases. This at least wasn’t a yawn fest. I enjoyed my inaugural year and will be back next year as well! They are sure not givng out the correct odds here..
but UD is not telling the truth for sure..
for non-auto inserted with higher odds – the odds are NO WAY like they show here..
UD is once again lying about the odds – so that people overvalue these inserts..
which UD can make a ton of because they are not numbered..
either number the cards and say that but dont overstate the insert odds.. Terrible, over priced product. I will say it again. UD has lied about this product from the start. This is probably geared towards 8 year olds because UD was told they need a product for kids. Guess what, kids think this product is terrible as well. This is not a kids hobby anymore! This is considered a low end product . It should be at the bottom of a toilet & flushed even deeper . Come on UD we all know you own hockey now but at least give us something ??? You guys are just turning into Money WHORES like all the big Co. Disney , Mavel , & so on . Not that you guys belong in such elite company . BIOYA. I wanted to take a minute to thank the author for this resource and all the other posts describing other sets. Admittedly, I haven’t collected in decades, but Connor McDavid has lured me to start, this time as a hobby with my son. Whenever a new set is released, your blog is where I come to inform myself about what’s included in the set. Interest rates have made collecting for those of us in Canada a pricey venture, adding about 35% more to the price of cards on eBay. If our dollar was doing better I’d buy more than a box, but so far, it saves me money to buy the cards we want on eBay. The interesting thing I’ve noticed about this set is that the Rising Force Gold cards seem the most rare, numbered to only /99. It’s surprising to me to see so many autographs on eBay, they out number the RF Gold cards for sure. I think there has only been 4 of the numbered Connor McDavid RF Gold cards listed. They’re selling for around $500 each, although I expect that to increase as the listed cards in this SP sell. Anyway, thanks again for all the work you do to keep us informed, new and seasoned collectors alike. 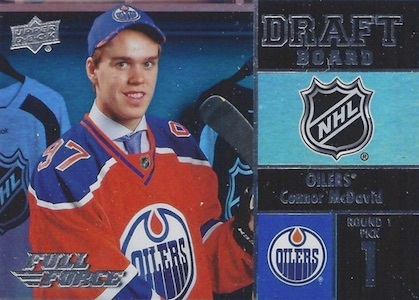 So far I have a Tim Hortons #1 Draft Pick, an OPC Redemption Connor McDavid, a YG rookie, the rookie redemption from Artifacts, including the l-V parallels, a red Parkhurst, and the Beckett covers cards with Connor McDavid, and one of the Rising Force Gold /99. SJP � We appreciate the kind words, SJP! Welcome back to the hobby! i’m gonna say something very unpopular. i like these cards. they are a solid buy at 64$ a box. they are selling well and I like something different. the look is better than i expected and they are just a fun product. Absolutely LOVE these cards- and alluding to another responder, I am 59 years old… older than the 16 yrs. of age that he alludes too! I have 9.8 MILLION cards in my 52 year old collection and these are some of my favorites… Thanks Upper Deck!! When I bought my first couple of boxes I was thinking I would either love it or hate it. I love it. Even with the exchange on the Canadian Dollar the price point works for me. I picked up a few more boxes and was fortunate to get a Lemeiux Auto (1:18,000) and a McDavid Auto (1:8,132). As a jets fan I also like the Jets cards included (lots of Ehlers) and of course the numerous McDavid cards included in the product and a fairly good Auto lineup I think it is well worth the cost. Fills the gap between UD1 and UD2 for me. Enjoy your website, I use it a lot! Love this set, the die cut cards, autos and 3D cards are great. 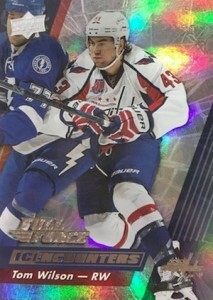 I loved the O Pee Chee platinum cards, and this fills the void nicely. Very fun product, I like the multiple sub-sets, and the fact that you get one “hit” per pack. The photos do not do justice, the cards look much better when you hold them. Except the Thermal Threats that are absolutely awful! I think the price point is a little high for the value though, but overall, it’s pretty good, diverse product that give you a very fun break. Mike Gauthier � It boils down to total cards, cost and format exclusives. Blasters retail for $20 and have 8 packs. Hobby has 18 packs, is closer to $60-70 per box and has better insert odds and several exclusives inserts. Also, every other hobby box is supposed to have an autograph. Extremely ugly designs at least in my opinion. For the price point though its not too bad. Checking in to see if UD is coming out with 2016-17 Full Force? very fun break getting 17 inserts out of 18 packs in the hobby box 2 out of the 3 boxes opened got two 3d freshman cards beating the odds . very cool all the way around . great value for the buck! 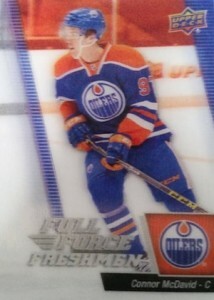 2015 16 UPPER DECK FULL FORCE HOCKEY HOBBY BOX - MCDAVID RC!